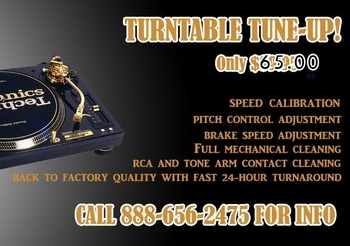 Turntable Repairs, Vintage Turntable Repair, Technics SL1200 series Repair, All electronics repair DJParts - All Variety of Parts that DJ Needs. We Repair All Electronics Our technicians can repair all pro DJ, audio, video, and general electronic equipment. We are specialize In Technics SL1200 Series And can repair theme with in 24 hours we carry all the parts in stock for sale and repair. DJ Mixer Repair Available in 24 Hours , All Pioneer DJM's Mixer parts are in stock for Immediate repair. Our highly experienced technicians have the skill to take on just about any repair. Returned to its Original Specifications within 24 hours!